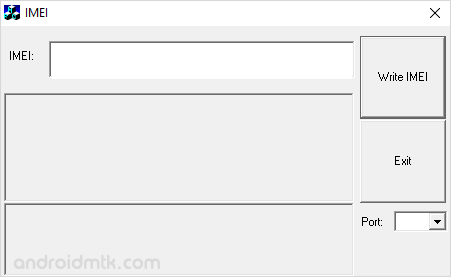 MTK IMEI Tool is a small application made by AppWizard, that allows you to Write or flash IMEI on MediaTek Devices. Here, on this page we have shared the latest as well as the old version of MTK IMEI Tool. MTK IMEI Tool only allows you to flash single IMEI. Means If your device is having Multiple Sim Slots then this tool will not help you to fix the IMEI Problem, and to write Multiple IMEI on your Mediatek Devices you need to use SN Write Tool. [*] How to Open: After Downloading the IMEI Tool, extract it on your computer > Open the extracted folder > Debug > WriteIMEI.exe. [*] Supports Single IMEI: It only allows you to flash IMEI on Single SIM devices (mediatek). If your device is having Multiple SIM Slots then use SN Write Tool to flash multiple IMEI at the same time. [*] Caution: Flashing IMEI other than the original IMEI is illegal in many countries and may cause serious troubles to you, so beware. [*] Whats your current IMEI Number? To know the current IMEI number of your device, Dial *#06# on your device. You can also see the IMEI number written on the back sticker of your device (you can see the sticker after removing the battery). [*] Credits: MTK IMEI Tool is created and distributed by AppWizard. This application is made by using the basics of Microsoft Foundation classes.